Science curiosity appears to counteract people’s tendency to seek out only information that supports their political biases. A study published today finds that people who are especially curious about science are more willing to grapple with surprising information that runs counter to their political leanings than people who are less curious about science. The study, “Science Curiosity and Political Information Processing,” was published online in the journal Advances in Political Psychology. The research was led by a team from Yale University and the Annenberg Public Policy Center (APPC) of the University of Pennsylvania. Prior research has shown that most people prefer to encounter material “that fits rather than challenges their political preconceptions,” in what’s known as the “echo-chamber effect,” said the lead author, Dan M. Kahan, a professor of law and psychology at Yale University and a past visiting scholar at APPC. But that’s not true for people who are curious about science. Science curiosity is different from science knowledge, however. People who are more knowledgeable about science tend to be even more polarized than those who know less about science. On global warming and fracking, for instance, liberal Democrats see a higher risk than conservative Republicans. And the more they know about science, the greater the difference between these groups. But researchers found that as the political partisans’ level of science curiosity increased, the extent of polarization becomes progressively smaller. “As their science curiosity goes up, the polarizing effects of higher science comprehension dissipate, and people move the same direction on contentious policies like climate change and fracking,” Kahan said. The study was based on observational and experimental data, which included a science curiosity assessment involving samples of 2,500 and 3,000 people administered by the market research firm YouGov. The test subjects viewed excerpts of one of three videos on science issues, including evolution, or a non-science video, and their level of engagement was measured. The study grew out of a collaborative research project on science filmmaking to increase public engagement. Partners in the Evidence-Based Science Filmmaking Initiative include the Cultural Cognition Project at Yale and Tangled Bank Studios at the Howard Hughes Medical Institute. In addition to Kahan, the researchers on this study were Kathleen Hall Jamieson, director of the Annenberg Public Policy Center; Asheley Landrum, a postdoctoral fellow at APPC; Katie Carpenter of the Cultural Cognition Project, and Laura Helft of Tangled Bank Studios. To read the study, click here. To download the news release, click here or read more on EurekAlert! 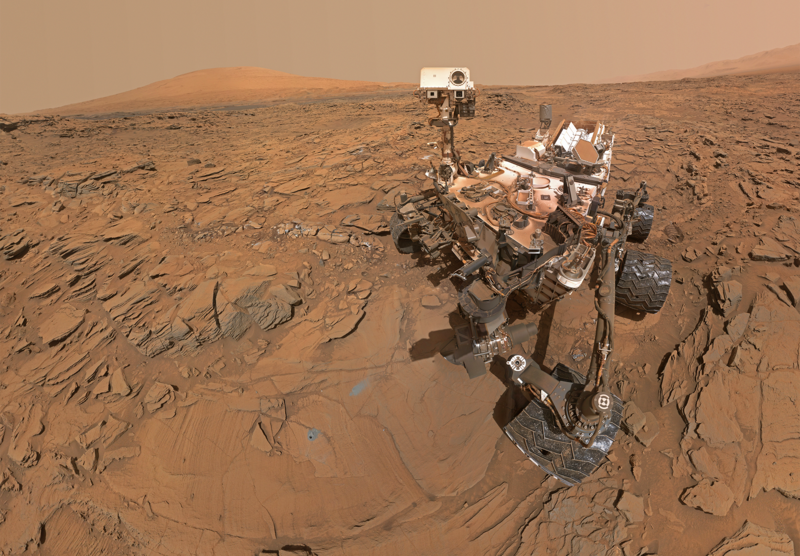 Self-portrait of NASA’s Curiosity Mars rover. Credit: NASA/JPL-Caltech/MSSS.